The Vancouver Canadians Baseball Foundation is built on four pillars which are Hope, Opportunity, Self-Development & Excellence. Our vision when we created the VCBF was the development and inclusion of children between the ages of 7-13 who could use assistance both socially and/or economically. Chairman Jeff Mooney had a belief that this window of opportunity age wise gave our Foundation the chance to find children who needed direction and guidance, providing them with the skills they would need to succeed in life both on and off the field. Since 2011, we have welcomed more than 2,500 (300+ per summer) children into our Foundation's Youth Baseball League operated out at historic Scotiabank Field at Nat Bailey Stadium. As well, our scholarship donation each year presented to the University of British Columbia Thunderbirds Baseball Program is used solely on local players from within the Lower Mainland who aspire to continue their education at UBC while playing baseball for the T-Birds. We have helped more than 65 players continue their post-secondary education thanks to this annual donation. For nearly a decade, we have donated annually to Challenger Baseball to help support local youth who had physical and/or cognitive challenges. In 2017, the Vancouver Canadians Baseball Foundation in cooperation with Variety - The Children's Charity, Jays Care & The Vancouver Board of Parks & Recreation helped raise $600,000 to create Western Canada's first ever fully-accessible, synthetic baseball field located just steps away from Nat Bailey Stadium. The Variety Challenger Baseball Field of Dreams gives children from all-across the region a place to truly call their own and was the Canadians crowning achievement. We still have much to do within our community as the need for support and leadership really never ends. The Scotiabank Vancouver Canadians Hot Stove Luncheon is our primary fundraising opportunity to spearhead funding and continue reaching out into our community thanks in large part to your generosity. The 1st Annual Scotiabank Vancouver Canadians Hot Stove Luncheon took place on Friday, January 21st, 2011 and was held at the Coast Coal Harbour Hotel in front of a sell out crowd of 280 guests. That day we welcomed the Toronto Blue Jays caravan as they toured Western Canada and included manager John Farrell, catcher JP Arencibia and pitchers Ricky Romero, Brett Cecil and North Vancouver's Scott Richmond as well as General Manager Alex Anthopoulos. Our goal in Year One was to simply introduce our Foundation and raise funding for equipment needed for the children we hoped to have join our Youth League the following summer. Since then we have been honoured to welcome more than 20 Toronto Blue Jays guests ranging from up-and-coming prospects to Hall of Fame icons and legendary executives. Hosted by Vancouver Canadians broadcaster Rob Fai, each personality takes to the stage and shares little-known stories and insight that can only be found at this annual winter baseball extravaganza. Who have we supported with this event? In 2017, the Vancouver Canadians Baseball Foundation wanted to expand its fundraising efforts to go beyond just the one-day event on Friday. The creation of #BeyondTheNat was a way to get our message out over the course of the week leading up to the Hot Stove Luncheon and also create an online silent auction that fans from all across the world could take part in. This year, #BeyondTheNat will commence on Monday, January 21st at 9:00am and run right through our Luncheon. The Vancouver Canadians Baseball Foundation takes pride in presenting a fun, safe and enjoyable afternoon of baseball philathropy as we host our annual Hot Stove Luncheon in the heart of the city. There are a lot of moving pieces behind the scenes to ensure this event goes off without a hitch and below is our way of covering all the bases. Here are some Frequenty Asked Questions about our event that hopefully makes it even easier for you and your guests to enjoy the afternoon. We recommend arriving at approximately 11:30-11:45am as this will give you enough time to check your coat in, peruse the Silent Auction and grab a beverage as well as take your seat as our presentation starts at 12:00pm sharp in the British Columbia Ballroom. There are a multitude of choices that range from street parking to the Fairmont Hotel Vancouver valet. The most probable option is the eight-level parkade located just to the south of the Fairmont Hotel Vancouver with entry points off both Burrard Street (south of Georgia St.) and off Hornby Street (north of Robson St.) Note: This is not an endorsement, just a presentation of options. We will have a registration/check-in table located on the Conference Level of the Fairmont Hotel Vancouver that will have your name and/or the name(s) of all your guests as they arrive at this Luncheon. We ask that prior to Thursday, January 24th, 2019 that you RSVP with as many of your guest's names (if applicable) as possible to ensure a quick and timely check-in. 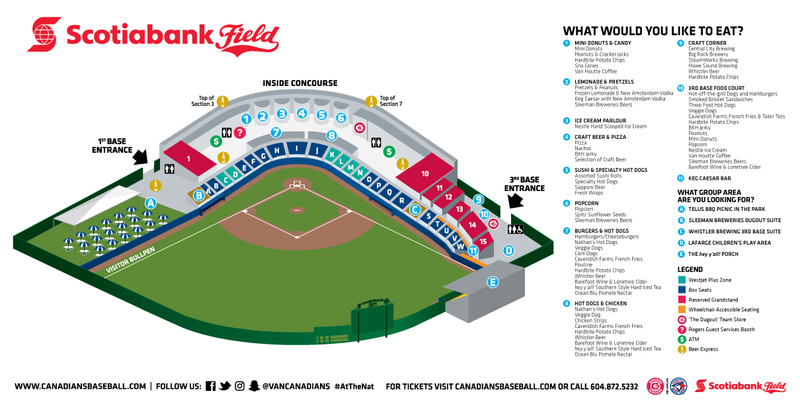 We will have a seating chart located just outside of the British Columbia Ballroom in addition to nearly a dozen Vancouver Canadians ushers and staff members all at the ready to assist you to your table. Will I be able to meet Cito Gaston or the Blue Jays special guests? We will have legendary Toronto Blue Jays manager Cito Gaston, General Manager Ross Atkins and President Emeritus Paul Beeston all on-stage over the course of the Luncheon to share their stories and updates with us all. We ask for guests to respect all three of these individuals as they enjoy lunch along with us. arrive, your green salad, dessert and variety of breads will already be on the table waiting for you. A chef-inspired chicken dish will be served as lunch, and for those with allergies and other dietary restrictions - we ask that you politely inform your wait staff of your request and we will do everything possible to facilitate your needs. Yes. We will have two (2) bars open as of 11:15am that will offer a variety of beverages and spirits and ask that should you partake in any alcohol-based beverages that you act responsibly and should you need assistance at any time for a ride based on your alcohol consumption, please reach out to any Vancouver Canadians representative or staff member from the Fairmont Hotel Vancouver and all of us will help in aiding your home safely. Where is your Silent Auction located and can I Register on-line in advance? If I finish as the high bidder for an item, how can I collect it? If you win an auction item, you will receive an email and SMS confirmation. Given you have pre-authorised your card upon registration the value will be deducted from this card immediately. You will go to the Silent Auction table where our staff will be waiting for you to show them your confirmation email and/or SMS and help present you with your item onsite. I know this is a fundraiser so what will be expected of me? We simply want you to enjoy your afternoon with us, period. Yes, we will have things like a Silent Auction and sell raffle tickets for the chance to win an autographed Cito Gaston Toronto Blue Jays jersey, but those purchased are solely at your discretion. We will be featuring some of the many community initiatives that the Vancouver Canadians Baseball Foundation takes on each year, and those programs do need your support but we trust that you will feel inspired enough to make that financial decision on your own without any pressure from us as your presence is what drives this event forward. Who is the primary sponsor of this event? For the 9th consecutive year Scotiabank has returned as title Sponsor of the Vancouver Canadians Hot Stove Luncheon. This year, Sandra Boyce, District Vice President, will be giving the official welcome to this year's event. I heard that Sportsnet650 will be on-location doing a radio show? Yes. Sportsnet650 is a proud media partner of the Vancouver Canadians Baseball Foundation and will have hosts Satiar Shah and Jawn Jang on-location from 9am through 12pm hosting their show The Playbook in the lobby of the Conference Level. Please feel free to stop by and support their efforts.